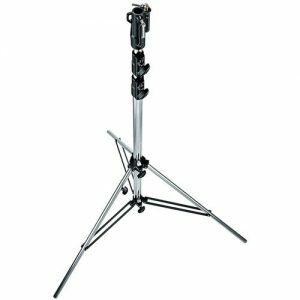 This is a Manfrotto Chrome Plated Steel Stand with Leveling Leg. It rises to a maximum height of 10.9′ (3.3 m). It has three sections and two risers. It accepts light fixtures that have a Baby (5/8″) receptor or a Junior (1-1/8″) stud. Many people in the lighting industry call this a combo-stand.